Butterflies are members of the insect family and their traits include 3 pairs of legs, a segmented body, and two pairs of wings. Although they are members of the insect family, and carry the same characteristics of other insects, butterflies generally appeal to people where most insects do not . Why are butterflies so unique? One distinguishing reason can be found by exploring a butterfly’s life cycle. 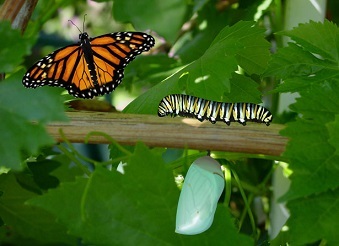 Butterflies go through the process of metamorphosis: a distinct transformation from an egg to a butterfly. As a result of metamorphosis, butterflies go through a series of four, very distinct, life-type changes. The four stages include: egg, larva, pupa, and adult. •Egg Stage - the beginning of life for a butterfly. The egg is a product of adult reproduction and is deposited on tree leaves by a sticky hormonal substance from the adult. •Larva Stage - typical in appearance to a caterpillar. The majority of the larva’s lifespan is spent eating and the first meal is usually it’s own eggshell. As a result of continuous consumption, the butterfly will increase several thousand times in size. It will spin a silky pad before progressing to the next phase. It is not yet mature and it is unable to reproduce at this point. •Pupa Stage – resembles a tiny leathery pouch. A pupa is also known as a chrysalis, and is a result of “pupating”. In transforming from the larva stage, the butterfly breaks out of its exoskeleton by wiggling out of their skin. A spiny appendage appears at the bottom of the abdomen and is called the cremaster. The butterfly connects the cremaster to the silky pad and hangs there to rest. Many body parts are visible including the wings, abdomen, legs, and eyes. •Adult Stage – known as the adult butterfly. The time length of the development cycle of the butterfly varies from species to species and from climate to climate (Monarch Watch). There are more than 150,000 species recognized however most of these are moths.